The temple is closely linked with the history of Saivite Child Saint Tirugnana Sambandar and is praised in his Thevaram hymns. This is the 4th Shiva temple in Pandya region praised in Thevaram hymns. Chithirai Tamil New Year day falling almost on April 14 or a day before or after occasionally in some year; Vaikasi Visakam in May-June; Lord Nataraja Tirumanjanam on Aani Uthiram in June-July; Special abishek to Ambica (Poopunitha Neerattu) on Aadi Pooram day in July-August; Utsav remembering the event of the palm leaf of Gnanasambandar floating against the current of Vaigai River on Aavani Avittam Star day combined with full moon day; Karthikai Deepam in November-December; Margazhi Arudra darshan in December-January, Masi Float festival in February-March and Panguni Uthiram in March-April are the festivals celebrated in the temple. 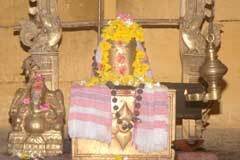 Lord Yedaganatha Swami is a swayambumurthi in the temple. Though the Shivrathri Puja is dedicated only to Lord Shiva in all temples, the fourth puja of the night is dedicated to Lord Bhairava in this temple, as followed in Kasi-Varanasi. Those lucky to have this Kala Bhairava puja on Shivrathri day derive the benefit of performing Ashwamwta Yaga. Sri Yedaga Nathaswami Temple, Thiruvedgam – 624 234, Madurai district. The temple is east facing with a colourful arch. 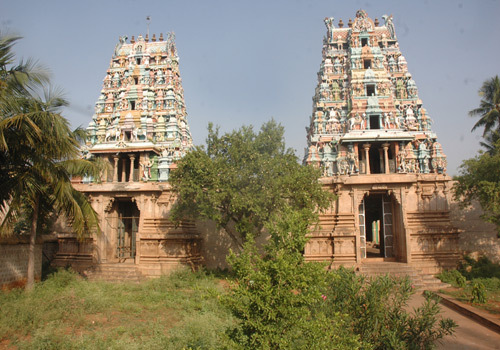 There are two five tier Gopurams-Towers for Lord and Mother shrines. There are shrines for 63 Nayanmars and the procession deities of Lords Bala Ganapathy, Dakshinamurthy, Yedganathar, Arumugaswami-Muruga, Ganapathi, Somaskandar, Mother Elavarkuzhali, Saint Gnanasambandar in the prakara. 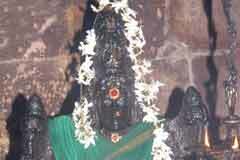 The temple is noted for prayers seeking wedding boons as the temple in Tirumananjeri. As people perform remedial prayers and pujas in Tirumananjeri for removal of obstacles in marriage efforts, devotees do it in this temple also. They offer garlands to Mother Elavarkuzhali and take to their homes. They worship the garland and perform pujas for 48 days to realize the wedding wish. After marriage, couple come to the temple and offer prayers to Ambica. There was a holy spring here created by Lord Brahmma. It is presently dry. It is said that those mentally retarded used to have a dip and were cured. It is still hoped that this could be restored to original glory if efforts are taken to desilt the tank and renovate the steps. As there is no water in the tank now, the deity is simply taken in procession within the tank. Vaigai River is the other holy water source. As the Holy Ganga, Vaigai too flows northward from the south. 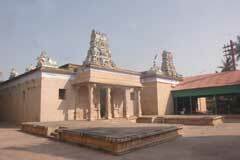 The place is also situated on the northern bank of Vaigai. Ashes of the dead are dissolved in the river for their salvation. People also light Moksha deepa for the liberation of the departed souls. There is a festival in the temple almost each month for a day only. Only Navarathri is celebrated for 10 days. Though there is a flag post – Kodimaram in Tamil – Brahmmotsavam is not celebrated in the Temple except an abishek to the post in Chithirai first day-Tamil new year day when Panchanga-almanac is read out. 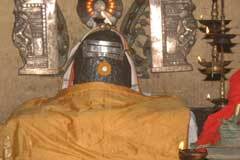 Traditionally, there are Dwarapalakas in Lord’s shrine and Dwarapalakis in Ambica shrines in the temples. 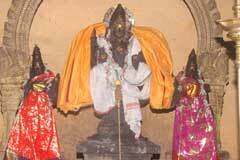 Here, Dwarapalakas are in Mother Elavarkuzhali shrine thus making a difference with other temples. Yet, sometimes, the priests dress them with saris considering them as Dwarapalakis. 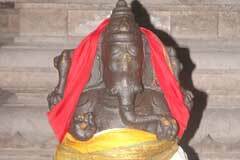 Lord Vinayaka: There is a sculpture on a pillar of a Vinayaka on the Moojuru vahan-belonging to rat family- in a different posture, called Hearing Vinayaka with ears open to listen to devotees’ prayers. When Gnanasambandar placed his palm leaf with a verse on Lord Shiva in Vaigai River in a contest against the Jains, this Vinayaka stopped the leaf and was responsible for its reaching the bank of the river. He took the form of four fishes in four corners, caught it and brought it to the shore on his trunk and sat on the steps. Hence, He is also praised as Debate Winning Vinayaka – Vadhil (debate) Vendra (won) Vinayaka. He is now in a separate temple outside the main temple. It so happens in families that marriages have to be solemnized any day anytime due to some urgent reasons though not auspicious. It causes mental agony and fear also about the future. In such circumstance, the devotees carry a Patrika (wedding invitation card) and place it at the feet of Yedganathar-now Patrika Parameswara with betel nuts and invite Him to attend the marriage. Then you can conduct the marriage with all peace of mind. There is still a controversy about the place where Chattainatha Siddha attained Samadhi. Seven places claim this honour. During his visit to Thiruvedgam, he saw Shivalingas scattered on the way and was afraid to tread on the way. Boys in the place use to simply carry him to the temple. He changed the river sands into some useful things and offered them to the boys. Chattai Nathar and his followers used to put the sacred ash in the water soaked rice (Neeraharam in Tamil) and cured stomach aches. Following this example, even today people use to bring the water soaked Neeraharam to the Chattai Nadhar Adhistana (Samadhi), place it on the Linga there and consume it for stomach problems. On the new moon day in the month of Aadi – Aadi Amavasya in July-August, Guru Puja is dedicated to Siddha. The name of Mother Elavarkuzhali means that Her hair (Kuzhal in Tamil means hair) is naturally fragrant. Devotees offer nivedhanas made of roots grown under the ground along with rice of buffalo curd and Ellu balls (Ellu is the seed from gingely oil is extracted) to Varahi one of the Saptha Madhas in the temple. There are two Durga Mothers in the temple – one facing south and one facing north, a different and rare feature in this temple. 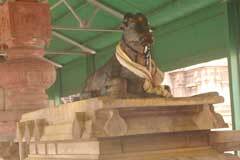 There are two Rajagopuras in the temple, one at Lord and one at Mother shrine. Sundarar, one of the four celebrated Saivite saints came to this place but was reluctant to walk to the temple. He thought that would be unjust and a sin to touch the way with his legs sanctified by Saint Gnansambandar. He was contended to worship Lord Thiruvedaganathar from the boat itself he was in on Vaigai River. There is a sculpture in the temple depicting this event. Pandya kingdom with its capital at Madurai was under the rule of Koon Pandian (hunchback Pandiyan) then. Those were the days when Jainism was dominant in the kingdom with political support – king’s support. Saivism and Shiva worship were almost routed out. Child Saivite Saint visited the city in such a situation. This created a fear in the minds of the Jain monks. They set fire in the camp of the saint to eliminate him. Knowing their evil design, Ganasambandar sung 10 verses directing the fire on the king who was their support then. The effective verses had their impact on the king affecting him with severe burning small pox boilsin the whole body. The Jain monks did their best with the mantras they knew, but in vain. The king appealed to people to help him in his distress. 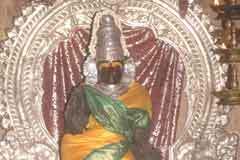 All merciful Gnanasambandar came to his palace, sung a Pathigam-10 verses- beginning with line “Mandhiram Avathu Neeru” meaning the best Mantra is the sacred ash on the Body of Lord Shiva, brought the ashes from the kitchen of Mother Meenakshi Amman temple and applied it on the body of the king. The small pox disappeared miraculously immediately even with any of symptoms. King began to think of the glory of Saivism. The Jains, shaken by the incident said that it was witchcraft work of the saint and challenged him to a contest and vowed that they would leave Madurai if defeated. The contest was that both will write a verse and place it on the floods of Vaigai River. The victor will be the one whose song leaf swims against the current and reaches the banks. If lost in the current, they will be the loser. Jains wrote the verse beginning with the lines Athi Nathi. Sambandars’ verse began with “Vazhga Andanar, Vanavar Aaninam”. Jains’ leaf was washed away. Sambandar continued his song Vanniyum Mathamum and the verse leaf reached the shores establishing the Might and Glory of Lord Shiva. Yedu in Tamil means the palm leaf used for writing in those days. The place where the Yedu reached the shore came to be known as Thiruvedagam and the Lord Yedaganathar accompanied by Mother Elavrkuzhali. Thiruvedgam is 17 km from Madurai on the Solvandan route. Town buses are conveniently available from Madurai central bus stand.